Jul27 by John M. Buol Jr. The National Trophy Individual is the largest and most prestigious Service Rifle match in the United States and has been a critical component of the National Matches for decades. The U.S. Army Reserve Marksmanship Program was very well represented by its Service Rifle Team with a number of significant wins. MSG Robert Mango secured first place overall in the NTI, winning the Daniel Boone Trophy. He also takes the Association of the US Army Trophy (high Army), Citizens Soldier Trophy (high Reserve), and 25th Infantry Division trophy (high Infantry). Sgt. Nickolaus Mowrer finished second. A total of four USARCMP members made the top ten with CPT Samuel Freeman and SGT Joseph Hall taking fifth and sixth, respectively. 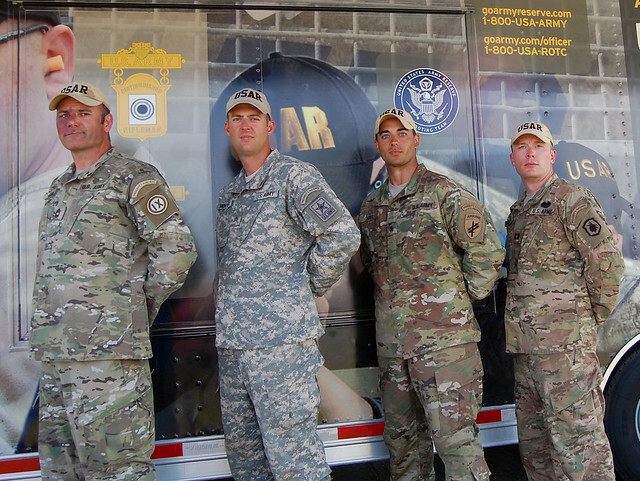 The Citizen Soldier Trophy recognizes the top Reserve component military personnel competing in the NTI. USARCMP shooters took nine of the top ten there with Master Sgt. MSG Robert Mango, SGT Nickolaus Mowrer, CPT Samuel Freeman, SGT Joseph Hall, LTC Scott Klawon, MSG Norman Anderson, CSM Steven Slee, SFC Dorosheff, and SFC Jacob Probst. SFC Adam Stauffer, SFC John Arcularius, and SFC Spencer Manning rounded out 11th, 12th and 13th place, respectively. Four USARCMP shooters made the top ten of the National Trophy Individual. From left, MSG Robert Mango was first place, winning the Daniel Boone Trophy, SGT Nickolaus Mowrer was second, followed by CPT Samuel Freeman and SGT Joseph Hall in fifth and sixth overall, respectively. This entry was posted in Service Rifle and tagged CMP, FY16-summary, NTI.